Cheesy Hamburger Pasta Bake is sponsored on behalf of Progresso™ The opinions and text are all mine. When it comes to the holidays, I find myself needing easy recipes that can feed more than our usual five. We have family over more often during the last few days of the year. Sometimes we order out, but I prefer to have some recipes in my back pocket that are easy and delicious. Cheesy Hamburger Pasta Bake is our take on one of our family’s favorite classic dishes — macaroni and cheese! One of my favorite things about the holiday season is the time spent with our extended family. Family meals shared this time of year are just a bit more special. So it’s all about comfort food when we get together. If we don’t have macaroni and cheese as a side dish then it needs to be part of the main dish! 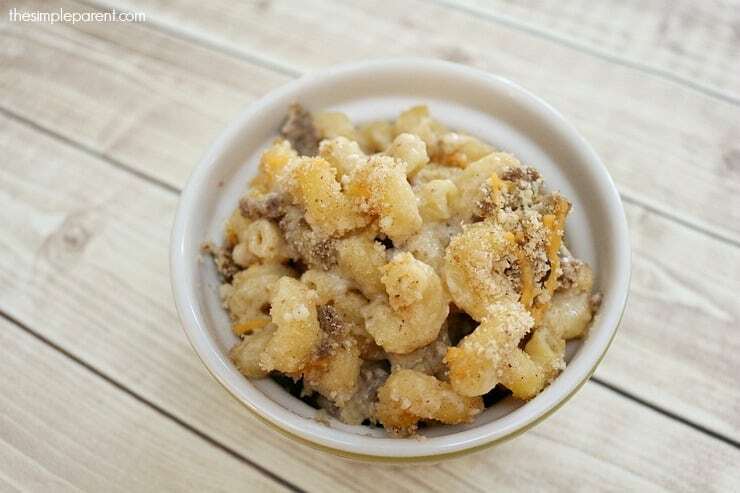 With our cheesy hamburger pasta bake, I take everything we like about macaroni and cheese (the creamy cheese and bread crumb topping) and add in some protein to kick it up a notch. But it’s still easy to prepare! 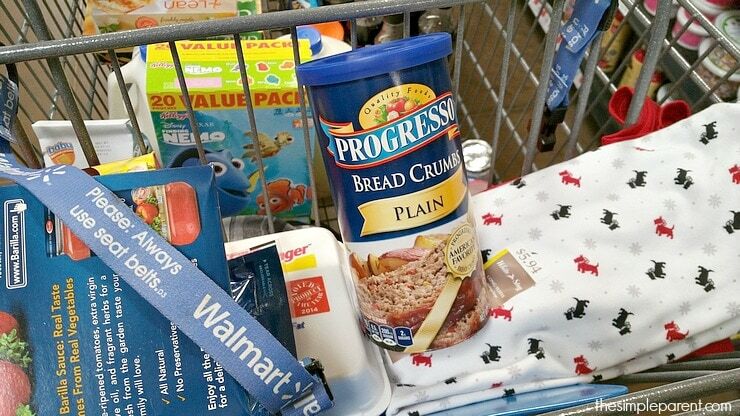 I save a bit more time by using products like Progresso™ Bread Crumbs. They’re a staple in our pantry and get used a lot during the holidays. But they’re a must when it comes to any version of mac and cheese because they taste homemade and delicious! We picked up a new container on our recent trip to Walmart so I was ready to whip up another batch of our favorite cheesy hamburger pasta bake! 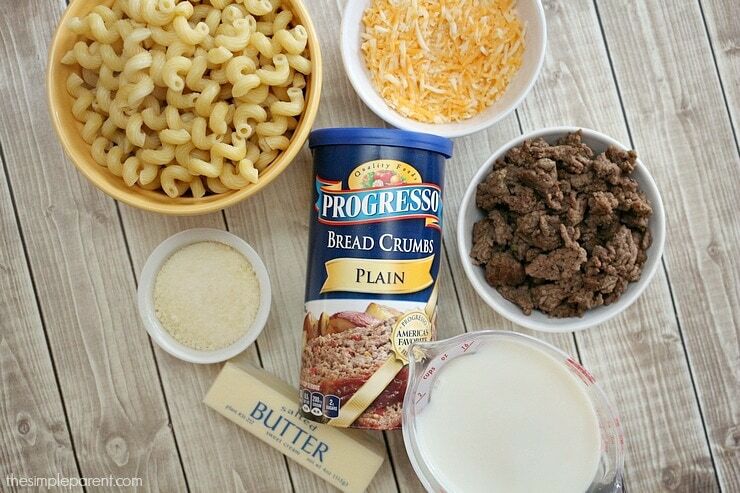 While pasta and ground beef is cooking, melt 1 Tablespoon of butter in a large skillet. Stir in the flour, salt, and pepper and mix until smooth. Add milk gradually and bring to a boil. Cook for 2 minutes, stirring constantly until thickened. Remove from heat and stir in 1 cup of shredded cheese until it’s melted. 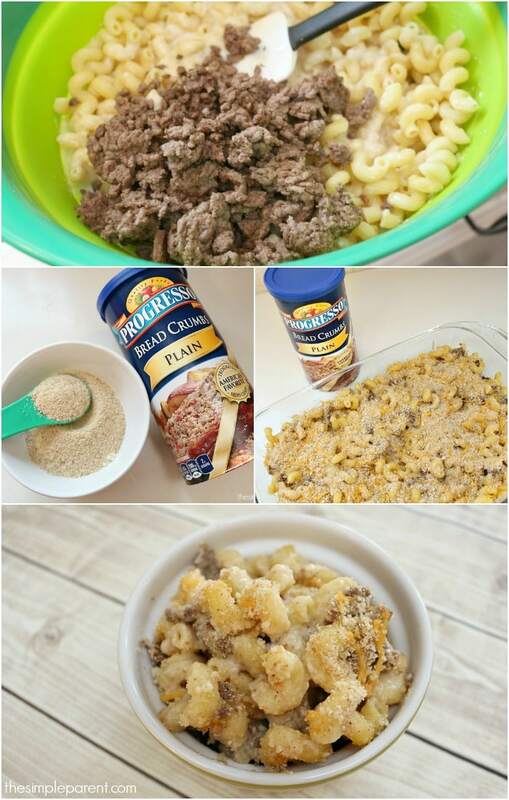 Drain pasta and combine with browned ground beef. Add pasta and beef to cheese sauce and stir until well coated. Spray a 9×13 baking dish with nonstick cooking spray and pour pasta and meat into the dish. Cover with foil and bake for 20 minutes. 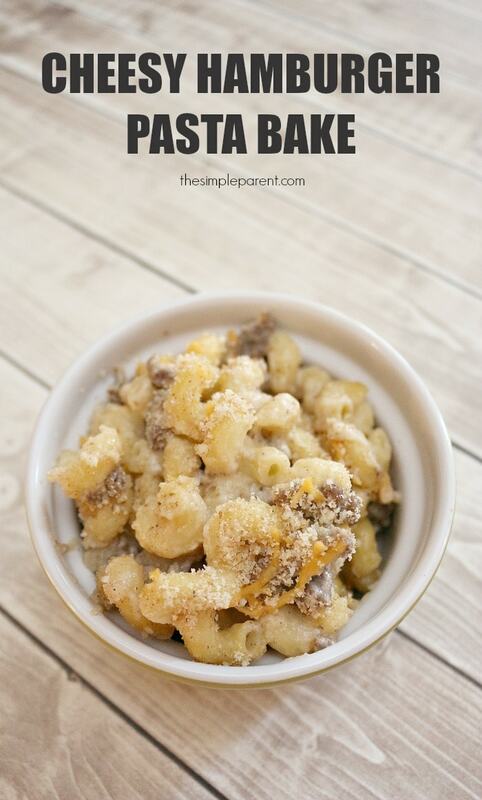 Combine 1 Tablespoon melted butter and bread crumbs together in a small bowl. Stir in shredded cheese and parmesan cheese. Once pasta comes out of the oven, sprinkle topping over the entire dish. Bake uncovered for 10 more minutes or until topping is lightly browned. Once the dish is in the oven, I’m able to sit back and relax with the family. Love it! The cheesy hamburger pasta bake goes well with steamed veggies (on the side or mixed in if you dare) or a fresh salad making it versatile! The leftovers are great reheated too! The bread crumb topping is what makes it just a bit more special and my family always wants to make sure I’m adding it for that extra crunch. So I have to make sure Progresso™ Bread Crumbs on hand for all of my holiday meal prep. Because the holidays are all about the food around here! « Help the Kids Make Tissue Paper Ornaments That Double as Suncatchers!